Bolt-On Big Bore Kits - Only $530! Our most popular Twin Cam kits! For even more torque and power with your stock cylinders, let us bore them all the way to 3.938", which gives either 98 or 107ci depending on the year of your bike. This is roughly an additional 3% on top of the standard overbore conversion described below. We've done this many times and have never seen a problem with taking the stock cylinders this far. The only down side is that you have no overbores left in your cylinders - many tens of thousands of miles down the road when you need to freshen the top end, you'll have to get new cylinders. However, Twin Cam cylinders are not expensive, so this is a relatively small downside. Premium quality Sledge Hammer pistons will be custom fitted, and rings, wrist pins, circlips, and a complete EST top end gasket set are all included. As with the conversion kits, we offer the convenience of a pre-assembled kit as well. We'll thoroughly clean your cylinders, precisely gap your rings, and then pre-lube and assemble the pistons and rings into the cylinders. The ready-to-install assembly will then be shipped to you in a sealed plastic bag to keep it clean and safe. This service makes the installation a breeze, as you simply lower the piston down enough in the bore to expose the wrist pin hole, position it over the connecting rod, insert the wrist pin and circlip, and push the cylinder down into position. No special ring compressor tool required! Converting your TC88 into a TC95, or TC96 into a TC103, is easy with a conversion kit from HAMMER PERFORMANCE. Send us your cylinders and we'll bore them to a full 3.875" bore using our exclusive CNC boring process. We'll then hone them to perfectly fit a set of premium quality light weight Sledge Hammer forged pistons. Rings, wrist pins, circlips, and a complete EST top end gasket set are included as well! For the ultimate in convenience, opt for our Pre-Assembled Service. We'll thoroughly clean your cylinders, precisely gap your rings, and then pre-lube and assemble the pistons and rings into the cylinders. The ready-to-install assembly will then be shipped to you in a sealed plastic bag to keep it clean and safe. This service makes the installation a breeze, as you simply lower the piston down enough in the bore to expose the wrist pin hole, position it over the connecting rod, insert the wrist pin and circlip, and push the cylinder down into position. No special ring compressor tool required! If you're looking for a super strong Twin Cam engine that will give years of reliable performance, look no further than an Axtell Twin Cam engine kit from Hammer Performance! Build your Twin Cam into a 107 or 117 cubic inch tire shredding monster with one of these top quality kits from the biggest name in HD engine kits, Axtell. 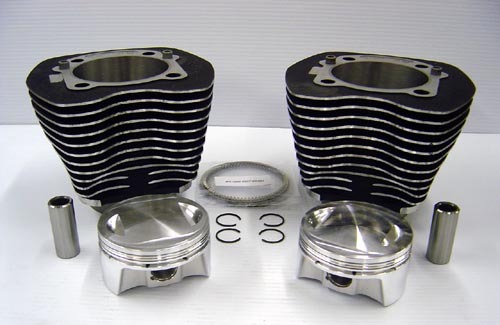 The 107 cubic inch kit is made for your 1999-2006 Twin Cam (4.000" stroke), and the 117 cubic inch kit is made for your 2007-present model (4.375" stroke). The 117 cubic inch kit can be put in a 1999-2006 motor if the crankshaft is changed, call for details. Both kits use a 4.125" bore, which is the largest Twin Cam bore size we recommend for a long-life, reliable Twin Cam. These kits keep your engine at it's stock height, meaning it will still fit the same in your frame, giving you the same access, and your intake manifold and exhaust system will bolt right up with no issues. Installation of any of these kits requires the boring of your factory Twin Cam cases to accept the larger cylinders. It's extremely important for long engine life that the boring is done straight and perpendicular to the crankshaft centerline at exactly 45 degrees. Hammer Performance bores cases using a precision 4-axis CNC machine for perfect accuracy. We've done hundreds of cases this way over the years with 100% success. Don't trust this critical procedure to just anyone with a mill and a boring bar, that is not a good way to do it! Let the experts at Hammer Performance make sure it's done right. If you're looking for everything your Twin Cam engine can give you, you want an Axtell Mountain Motor engine kit from Hammer Performance! There are several different ways to do each of these sizes, with respect to the combination of rod length, cylinder length, and piston compression height, and each of the options has trade offs. Essentially you're trading off engine height for rod-to-stroke ratio and piston skirt length. The taller you make the engine, the better you can make the rod-to-stroke ratio and the longer you can make the piston skirts, which gives longer life and better performance. But making the engine taller can cause frame fitment issues, serviceability issues, and problems with fitting your exhaust and intake. The good news is that Axtell offers almost every combination and the experts at Hammer Performance have the expertise to help you select the best combo for your specific situation. Give us a call today to discuss your project and we can make sure you get the right parts for your particular build. As with the standard Axtell Big Bore engine kits, installation of a Mountain Motor kit requires the boring of your factory Twin Cam cases to accept the larger cylinders. It's extremely important for long engine life that the boring is done straight and perpendicular to the crankshaft centerline at exactly 45 degrees. Hammer Performance bores your cases using a precision 4-axis CNC machine for perfect accuracy. We've done hundreds of cases this way over the years with 100% success. Don't trust this critical procedure to just anyone with a mill and a boring bar, that is not a good way to do it! Let the experts at Hammer Performance make sure it's done right.